Should Paddington Replace Kevin Hart as 2019 Oscars Host? 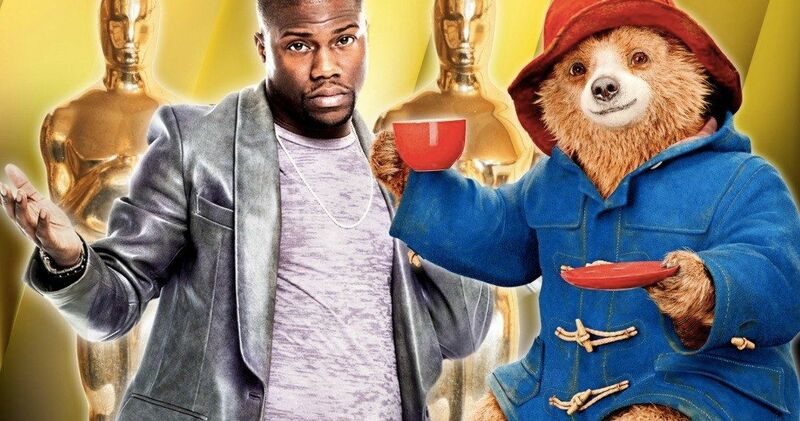 Fans on social media believe that Paddington Bear should replace Kevin Hart as host of the 91st Academy Awards. The Paddington 2 star has yet to make an official statement about his new-found fame, but one would have to imagine that he would be into doing it. Hart was announced as host earlier this week, but some old tweets containing anti-gay messages were unearthed, causing controversy, so the comedian made the decision to step down. This means that the Academy of Motion Pictures is in a scramble to find a new host, one with less of a controversial history. If Tupac and Roy Orbison can perform in concert as holograms, there’s really no reason why Paddington can’t host the Oscars. He has been to jail, but that was a mistake, and he was later proven innocent. Plus, the bear was able to make a lot of friends while locked up and made it a better place, just check out Paddington 2. He’s just a friendly fictional bear that would probably love to host a wholesome night of television to celebrate the entertainment industry’s most talented professionals. CNN media reporter Frank Pallotta seems to be the one leading the charge. He took the time to say, “I said it once and I’ll say it again, let Paddington host the Oscars.” From there, quite a few more people jumped on board the bandwagon. Someone else chimed in noting that the star of Paddington 2 is not “homophobic,” which is another plus, and then another person just put up one of Paddington’s best lines: “If we are kind and polite, the world will be alright.” He’s very wise for a fictional bear. Paddington Bear might be the best choice at this point in time. He’s much loved in the U.K., so it would be cool to see North America further embrace him. Though there could be some conflicts of interest if Paddington 2 is nominated for any Academy Awards, which might be the only box checked in the negative category. And he may accidentally cause a fire. Whatever the case may be, seeing the delightful little CGI bear might be what the world needs right now, not just the The Academy Awards, to see something positive instead of the constant negativity. Kevin Hart has taken a stand and refuses to apologize for his past anti-gay remarks on Twitter and during his standup material. The comedian has apologized for his behavior multiple times throughout the years and does not feel like he should have to do it again. With that being said, there could still be a future for Hart in another year at the annual event. And since Hart is out for the upcoming gig, let’s get Paddington Bear up on stage at the Dolby Theater in front of an audience of millions. People would definitely tune in. Or, take Chris Evans’ advice and call up Robert Downey Jr. You can read some of the support for Paddington taking over the Oscars below, starting with Frank Pallotta’s Twitter account. I said it once and I’ll say it again, let Paddington host the Oscars. Let Maya Rudolph and Tiffany Haddish host the Oscars along with Paddington you cowards. Let Paddington Bear host the #Oscars. He won’t make jokes about anyone, he will probably accidentally set the stage on fire. He will celebrate the winners with his whole heart and console the losers with his whole heart. We will all be better people for it.